When you find yourself in need of quality locksmith services – either in an emergency or by appointment – Pros On Call is there. We offer quality services from our 24-hour locksmiths in Ohio and only work with technicians with 5 or more years’ experience. If you are currently locked out of your car, business, or home, do not attempt to force entry. Doing so will likely result in an expense much higher than calling a locksmith in property damage and/or personal injury. Call us right away if you have need of any residential, commercial, automotive, or emergency lock services. Our local, mobile units are available in many locations throughout Ohio and are waiting to help you. If you are currently locked out of your car or home, do not attempt to force entry. Doing so will likely result in an expense much higher than calling a locksmith in property damage and/or personal injury. Call us right away if you have need of any residential, commercial, automotive, or emergency lock services. Our local, mobile units are available in many locations throughout Ohio and are waiting to help you. We specialize in fast, efficient assistance for home lockouts, car lockouts, office lockouts and much more. We also provide expert time-sensitive services like burglary damage repairs, emergency lock changes and re-keys, and a host of other security-related services for vehicles, homes or business, all available where and when you need them. We can open virtually any lock, including high-security locks and deadbolts. Call now to learn more about our complete range of emergency locksmith solutions in Ohio. A car lockout can be a scary thing, especially late at night and away from home. We offer expert 24-hour automotive locksmith services in Ohio for any car lockout situation. When you call Pros On Call, you can be assured of a response within 30 minutes from a qualified Pros On Call local locksmith. We will solve your problem and get you back behind the wheel in no time. Need immediate help with an office lockout? Looking to upgrade your office security? Pros On Call is here to assist with any and all of your locksmith-related needs for your business. 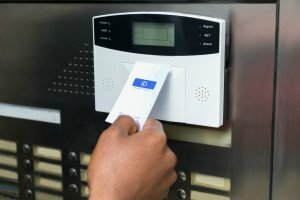 We provide repairs and installation services for access control systems, security systems, safes, master key locks, door closers, magnetic door locks, panic bars, and more. Our licensed commercial locksmiths in Ohio are fully equipped to handle any type of job for large and small business properties throughout the state. Pros On Call offers far more than emergency service during home lockouts. We can also install and rekey deadbolts, assist with broken key removal, repair damages resulting from burglary attempts and more. We also install overhead door security and opening services and can help you get back into your shed, toolbox, file cabinet, or safe as well. You can always count on our mobile residential locksmiths to be available at a moment’s notice in your area. We can perform most common lock change and rekey services immediately and can be called upon for any installation and repair service associated with lock services. When you select Pros On Call as your preferred locksmith in Ohio, you can be assured that you and your personal security are in good hands. Our technicians have decades of combined experience serving the needs of individuals and businesses throughout the state. We guarantee all of our customers the best possible experience by maintaining a high standard of quality and efficiency. We want to be the 24-hour locksmiths in Ohio you trust whenever you have need of any security-related service from simple lockouts to an expert installation of security systems and closed-circuit television (CCTV). Give us a call to learn more or request our locksmith services online right now. Ohio Locksmith https://prosoncall.com/ohio-locksmith/ 3.9/5 based upon 15 reviews.